24k. Bright yellow gold shimmer with gold microglitter. To be completely honest, I was expecting this polish to be a total disaster, but it wasn't! It's actually great! Usually a shimmer base metallic plus glitter equals lumpy mess, but that isn't the case with this. You can see all of the glitter through the shimmer, it's mostly smooth and it has just enough sparkle. The yellow toned base looks really good with the slightly more golden-brown toned gold glitter. Amethyst. Vivid dimensional purple shimmer with blue microglitter. These pictures lie about the color. It's really not that blue. Cameras don't like purple. Anyway, this is a really gorgeous shade of purple, slightly blue-toned but with some great red shimmer highlights, lots of sparkle and dimension plus barely-visible blue microglitter. This one looks a little bumpy. I'm not sure what the trick is with this- I've worn twice, once with lumps and once without and I don't know what I did differently. Emerald. 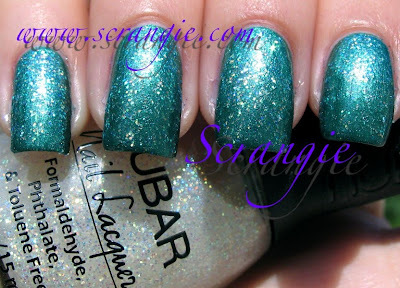 Light blue-toned green shimmer with green microglitter. While the rest of the shades in this collection exceeded my expectations, this one didn't even meet them. I do like the color of the base and the glitter, but they don't seem to get along with each other. The base of Emerald is very dense and shimmery, almost frosty even. The glitter can't break through the dense metallic base, so you end up with little lumps that look like bubbles. I think this would have worked if the glitter was larger or if the base was less metallic and a little thinner. Platinum. Bright white-silver shimmer with silver microglitter. This is another shade that I didn't think would turn out as well as it did. It's beautiful! A very shimmery, pearly silver punctuated by tiny silver microglitter. The glitter isn't the main feature of this polish, either- it's quite subtle. It adds a little bit of extra sparkle that makes you want to look at it a while longer. Ruby. Bright pink-toned red shimmer with red microglitter. I was expecting this to be yet another Ruby Pumps clone, but I'm pleased to say that it isn't! (Even though I would have liked that anyway.) This is a nearly magenta red shimmer, maybe in the light end of medium depth with just a splash of tiny red glitter. Like the others, the glitter isn't the prominent feature, it just adds a little extra sparkle. Sapphire. Medium blue shimmer with blue microglitter. WOW. This one needed two pictures because it's so gorgeous. This is, in my humble opinion, the star of the collection. It looks like sparkling gems! I've been wearing this as a pedicure for almost two weeks now and I don't want to take it off. The blue base is so shimmery on it's own that it doesn't even need the glitter to be eye-catching, but the addition of the glitter puts it over the top. Way to go, Nubar!! Best blue shimmer I've seen in a long time. Reminds me of an old discontinued China Glaze, Eyes Like Sapphires? Drinkin' My Blues Away? Perhaps both. Tiger's Eye. Rich cherry-brown shimmer. This is the only one in the collection that doesn't have glitter. That's okay, it doesn't need it. It's beautiful on its own. You can't go wrong with reddish brown for fall, it's the color of the changing leaves! It reminds me of the rosewood fretboard on one of my guitars. It's rich and shimmery and the shimmer has a texture to it that reminds me of really pretty wood grain. I don't know what it is... this polish just makes me think of wooden things. Tiara. Sheer opalescent glitter. See, I think it looks fine by itself! It's that type of fine, sheer, pastel opal glitter that makes me think of snow globes. You can see the glitter take on all kinds of shades- yellow, gold, pastel green, pastel blue, orange, pink... Pastel iridescent. The base is unusual- it seems like it should be sheer, but it looks cloudy. I think there's some smaller crystal shimmer in the base that makes it look milky. Tiara over black. You can see the tint in the base this way. Little speckles of shimmer. Since Tiara was made for layering, here are all of the shades in the collection with one coat of Tiara. Tiara over Amethyst. Color is not accurate- Amethyst is purple. The formula on these is very good. A little thick but easy to work with- no streaks, no pooling, no bald spots. They are very opaque. A lot of the shades were completely opaque in one coat, but I did two of each anyway. Some of the polishes do tend to look lumpy because of the glitter. Drying time is a little on the long side even with Diamont, but nothing unbearable. The wear seems great so far on my toes, but something bizarre happened to me with Amethyst. It cracked! I wore it for almost an entire day and something happened where the polish just... shattered... like glass! It all fell off in large shards. That hasn't happened since and I don't know what was going on that caused it to do that. I will have to experiment. I would love to give this collection a completely perfect review because I think the concept is excellent, but I don't think I can. Some of these polishes have a lumpy/bumpy look because the glitter is too fine to come through the base. That's my one complaint about these. Now, I mentioned above that one of the times I wore Amethyst it was perfectly smooth and once it was lumpy. There has to be some trick with application or topcoat to get it as smooth as it was. It tends to look smoother without topcoat, which is odd, I know, but it seems like the topcoat exaggerates the glitter-bumps. However, one of the times I wore it, it had topcoat and one finger was perfectly glassy smooth and the rest were slightly bumpy. 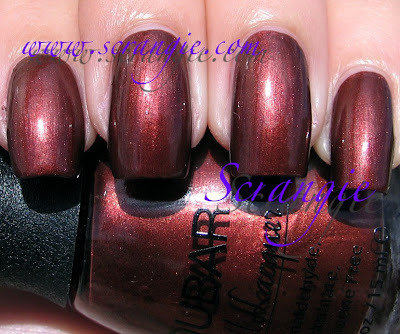 I used Nubar Nu Nail basecoat and Nubar Diamont topcoat just to be sure I was doing everything right. I need to do some more experiments with these to find the secret. Any ideas? I'm open to suggestion! Overall, I do like this collection. What can I say, you show me some glitter and I'll be happy as a clam. I like almost all the shades and the formula was really nice and smooth. Sapphire is totally backup-worthy. I'd call it a must-have for blue lovers. I can't stop looking at mine. 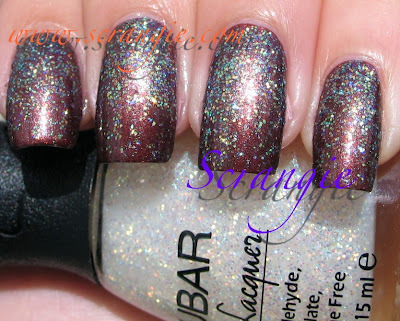 The Nubar Royal Gems collection goes on sale September 15th at ByNubar.com. thanks for the review :-) I like the basic colors of this collection, and the tiara is a nice touch. Amethyst looks GORGEOUS!!! So does Sapphire. Tiara is nice, too. 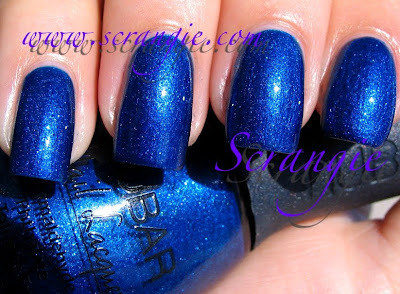 Even if I hate Nubar's customer service, they make gorgeous polishes. I especially love the Tiger's Eye; I thought I'd really like the Emerald, but now I'm not so sure, especially after those wonderful greens from the Going Green collection earlier this summer. Those look like maybe they were a little more blue? Hmm, nothing really wows me here. I guess that's good news! Same comment I had when I saw swatches from Nailphile a week ago. They look bumpy and gritty. It's a shame since it sounds like it's really pigmented and a one coater will do. Do you think i should just wait for China Glaze Wizard of Oh Ahz? They look similar. Sapphire is gorgeous and I also like Tiara. The rest are okay. I thought Emerald would be greener. It looks like a blue green. Love the swatches and commentary, as usual. Thanks Scrangie. I'm really interested in Tiger Eye. It's not a color I'd usually be interested in, but expanding one's horizons is a good thing. AMAZING I'm in love with the yellow shade- love it! I can't even begin to imagin what your polish collection looks like! Lol, How do you even begin to organize them? Any good storage tips? Tiger's Eye..would you say it's similar to OPI Romeo and Joliet? Thanks for the swatches. 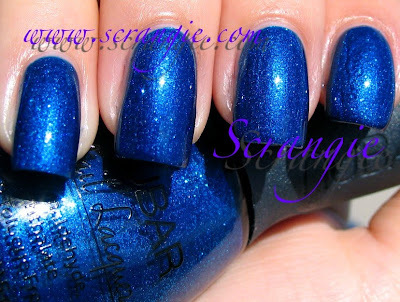 How does Sapphire compare to Zoya Tart? Trying to decide which blue to get..